Week 3 of the candidates speeches is here. Last week saw some definite opposition to the message of Bill O'Rights. We'll see if in the future he alters his tactics to get your support. I also suspect that his name is also helping to hold him back as Belle pointed out that it made her think of Bill O'Reilly. I think it's safe to say that no one wants that comparison, not even a carnivorous giant lizard. Bill has a lot of stumbling blocks to overcome, but again this is all prelims. Anything can happen between now and when a candidate is actually selected. Last week I put out the call to help support the cause and I'd like to make special note of Copyboy from Not Worth Mentioning for making TNR blog of the day on his blog during the last speech. If you don't follow him, you should. You should also check out his site Bloggerdise, which is a great way to hook up your blog with giveaways & promotions. Tomorrow a new voice with solid conviction will be vying for your support. 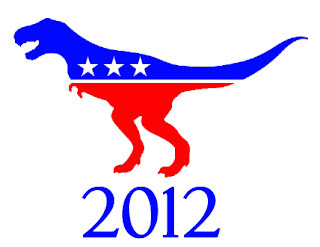 Don't worry, people can't make too much of a comparison, because Bill O'Reilly doesn't believe in dinosaurs. Tide goes in, tide goes out. Or something like that. I love Copyboy's blog too. I'm anxiously awaiting the next candidate. Bring on the next candidate! And Copyboy ROCKS. We all love him. Yeah Copyboy!! Go you! I'm ready for the next candidate!! I didn't think of the Bill O'Reilly connection until now. Drats. I thought I knew who I was voting for.